Click on city name for more information. Egypt is located in the northeastern corner of Africa and covers an area of 386,000 square miles. 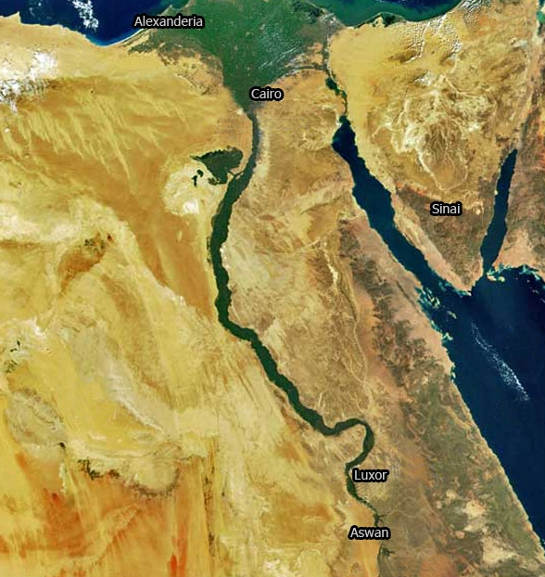 Only about 5% of the country is inhabited along the banks of the River Nile. Egypt's population are about 70 million, they have warm hospitality and have a distinct sense of humor. They have respect and a liking for foreigners, and a deep sense of tolerance for other races, religions and nationalities. Arabic is Egypt's official language. However, most Egyptians understand and speak English and French. In larger towns, the foreign visitors will encounter no difficulty in communicating with the people. Most seasons are the ideal to visit Egypt as temperatures vary between 60 and 80 Fahrenheit, Only summer months are hot, 80 – 105 Fahrenheit; however, the air is dry and humidity is low. In Alexandria, on the Mediterranean Sea, the months from May to October have the best wheather in the Middle East area. The basic unit of currency is the Egyptian pound divided into 100 piasters. Banknotes: 25, 50 (piasters), 1, 5, 10, 20, 50, 100 (Egyptian pounds). Silver coins: 5, 10, 20, 25 piasters. Fluctuating exchange rate stands now approximately at one U.S. $ = 5.7 Egyptian pounds.